KoopaTV: Register for the Super Smash Bros. Ultimate North America Open 2019! Register for the Super Smash Bros. Ultimate North America Open 2019! By LUDWIG VON KOOPA - There's a Splatoon 2 tournament too, if you know three other people for a team. Get ready to prove your skills in the hit Nintendo Switch game, Super Smash Bros. Ultimate! If you're in North America. (You can also prove them in Splatoon 2 for the same prize, but this article ain't about that.) Nintendo of America is teaming up with Battlefy (after previously teaming up with them for the Splatoon tournament in 2017 and the Splatoon 2 tournament in 2018), an eSports platform, to bring you twelve massive tournaments across four regions, with the prize being a trip to PAX East to compete in the Final Event for a worth-$500 “collectible item.” The PAX East trip alone is pretty worth it. The tournaments are all online-based (up until the PAX East trip), with 2048 players in each tournament. The first 9 matches of bracket are 7-minute Time best-of-1 battles with Items on low, and the last 2 matches are 7-minute 3-stock best-of-3 matches with Items on low.. The whole tournament is single elimination. PAX East has its own rules, but I highly doubt anyone reading this is actually going to win a qualifier, so I don't have to give details on that. If you want them, read the official rules. I already did. Not many people have. Ta-da! Go to Battlefy and scroll down to the map. 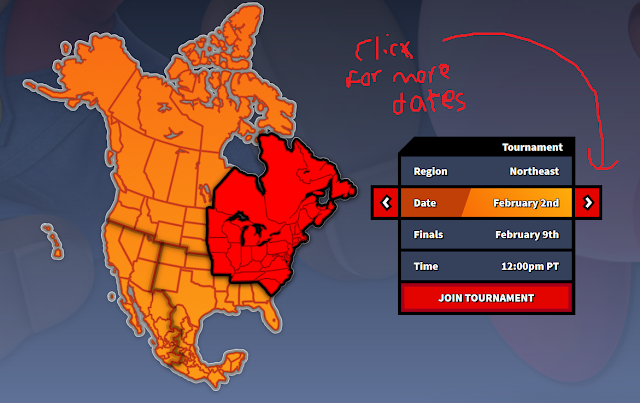 Go to the dates you want (using the red arrows) and click Join Tournament! Clearly, it's pretty obvious what the most populated region is. ...I wonder if the Northwest will even get to capacity. They also have a curious definition of what each region is, thanks to Mexico and Canada adding to it. All of those dates are on Saturday. You might have a decent chance of at least getting past round 1 and having fun. No purchase necessary (no venue fee, unlike most tournaments) — you just need a Nintendo Switch (or someone's Nintendo Switch who is willing to lend you it for a Saturday), Super Smash Bros. Ultimate, a “reliable high-speed Internet connection” (hopefully people without one of those don't join), and a Nintendo Switch Online membership. There's also a hidden requirement not listed by Nintendo but it's in the rules: you need to have a Discord account, because there's a Discord server you need to be in hosted by Battlefy. Well, I fit under all skill levels. I'm in. One tip if you register: Don't try and be “honourable” and not use items. Items are important. Use them. If you don't use them, your opponent might. That said, you can also use items spawning to your advantage by baiting your opponent into trying to go for an item, so they'd make unnatural plays that you can take advantage of. Smash Balls are the best example of this. While you're at it, please know the difference between a Smash Ball and a Fake (News) Smash Ball. Ludwig registered for all three qualifiers in the region that his Koopa Kingdom-based Internet connection is closest to. He'll let you know in the comments section after each tournament how well he did. As for you, you can do whatever you want in the comments section. He finds it a miracle that he didn't make a “Battlefly” typo. If I participated in the Super Smash Bros. Ultimate Open, I would probably be knocked out in the first or second round. I would advance much further in the Splatoon 2 tournament. The only problem is I do not know three others who would form a team with me. Guess you gotta find some Splatoon friends. Round 3: Got into a Sudden Death with Bowser vs. PAC-MAN... and won, because he tried to ledge-attack me, I shielded, and then I jabbed him out. On Lylat Cruise. Round 4: Won easily with Ludwig vs. Ganondorf. On Duck Hunt, which contributed greatly to how I won. Round 5: Lost with Ludwig vs. Ike on Battlefield. I thought Ludwig would do a lot better, but Ike's Nair pressure was too much to overcome on Battlefield, and he was able to get back to the stage for free when knocked off. I played as Lord Bowser for the entire tournament. Round 2: Fought Ness in Pokémon Stadium. I actually played very sloppily on the first life, but invalidated the whole thing with a Bowsercide. Ended up winning big-league. Round 3: Vs. Dark Samus on Smashville. They kept Super Missiling, getting me to shield, and then go for a grab. They weren't great at it, though, and started the match with a self-destruct due to air-dodging off the stage. Round 4: Vs. Ganondorf on Smashville. I didn't need to pick Ludwig to cheese out Ganondorf this time in a round 4 match. Round 5: Vs. Construction Mari0 with the tag "Fire Mario". Got easier to win as the match went on (he couldn't KO my first stock until like 220%). After the match the guy begged me for a rematch, but no, I have more fights to play. Round 6: Vs. a Wii Fit Trainer on Battlefield. Score ended up being +2 in my favour, which is the closest so far. Was a nice chap. Round 7: Fought a Zelda on Smashville. They told me before the match they were incredibly nervous, and the match started off even and then the dude fell apart and kept losing stock after stock. Round 8: Fought Pichu on Smashville, named GoldenVenu. He took the first stock and was winning for most of the game with me playing catch-up, but by the end we both had 6 KOs and 6 falls and we got to sudden death. Pichu won the sudden death and my tournament ended. GoldenVenu then won his next round, so he won the whole bracket, and he's going to play next week livestreamed. Round 1: Vs. Sonic the Hedgehog! I picked Pokémon Trainer, since I haven't used them in a tournament yet. I got my choice in Lylat Cruise. I easily beat them, but they reported my match to the admin afterwards claiming that I cheated and had the items on Medium setting instead of Low. This was easily disprovable, and they apologised for their mistake. Round 2: I was going to use Puff, but my opponent picked Bowser, so I cancelled and picked my own Bowser. We played on Smashville and he kept it even in the first minute since he Bowser Bombed and broke my shield. Then I destroyed him to the point that he stopped moving with his controller in the last minute. (15 KOs, 3 falls) Scrubs ain't gonna beat my Bowser in a ditto. Round 3: Fought Toon Link. Was worried it'd be someone who'd know how to use him and his projectiles, but all he did was Down-Air. I picked Lylat Cruise (and got it) and Pokémon Trainer and won easily. Round 4: My opponent picked K. Rool and the Duck Hunt stage. I chose Lord Bowser. No idea why he thought Duck Hunt was a good idea. He camped at the left side of the stage and spammed cannonballs and crowns. I just stood on the right side tree and his attacks wouldn't reach me. Eventually he approached and he got destroyed. Every time he was off the stage he tried to do the blunderbuss suction, but I wasn't going to fall for that. Round 5: He picked Inkling and I picked Jigglypuff. We went on Battlefield. He kept trying to Roller, which is what I was hoping he'd do since Jigglypuff does great against Roller but poorly against people who know what they're doing. So I won. Round 6: Opponent chose Fox vs. my Bowser on Smashville. This was easily the closest match so far, since he actually got the first KO. He didn't do a single Nair to Up-Smash, though, and his favourite Smash was actually Forward-Smash. I managed to win though. Guy claimed I was laggy. Pft. That's yours. Round 7: Fought another K. Rool, Kengar, who is active on the Discord server. Highly-anticipated match from the Discord regulars. I picked Kongo Jungle and we fought there vs. my Bowser. It was close but I did better as the match continued to progress, so I won. Round 8: ALRIGHT. FOUGHT YET ANOTHER PICHU. This one named Sumgai. I never figured out how to beat Pichu since qualifier #2, so I picked Pokémon Trainer. I picked Frigate Orpheon as my stage to try to do something different. I was given advice that a relatively flat stage would be better against Pichu, and as Trainer, I could try to zone out Pichu with Ivysaur and I could hit low on all the moves. Big mistake. SD'd my first stock early as Ivysaur since Ivysaur wouldn't Vine Whip the left side. Then Pichu sort of camped Thunderjolts the rest of the time, using the left platform to its advantage. They won, +5/-3. Later found out that Battlefield and platforms do better against Pichu according to a YouTube guide. Sumgai later won the bracket. So I lost to Pichu in round 8 two tournaments in a row, and that Pichu went and won the finals match after as well. I CAN'T BEAT PICHU.